When measured against the allure of speakeasies, hipster appeal of dive bars, and the upbeat vibe of jazz clubs, hotel lounges tend to seem pretty staid and unexciting in comparison. Save for being a convenient spot for resident guests to grab a nightcap, they probably won’t rank at the top of a barfly’s list. Club55 at Marina Bay Sands looks set to change this perception, though. 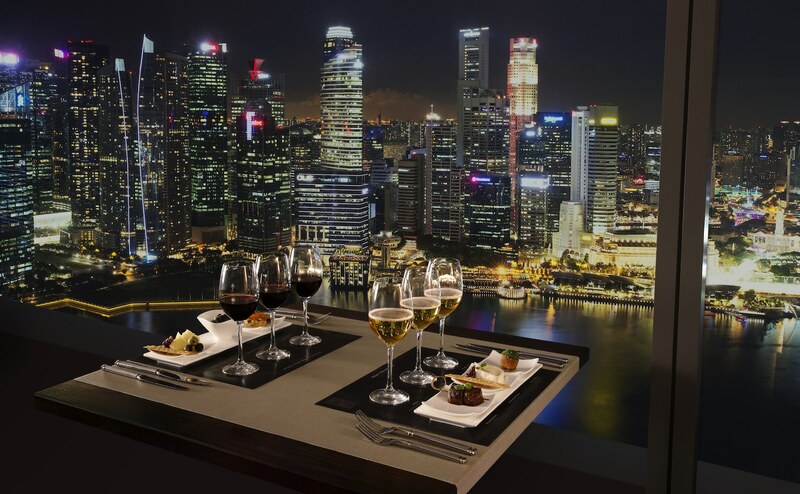 While it already has a venue that certainly works in its favour (it’s perched on the hotel’s 55th floor and comes armed with unbeatable views of the CBD and Gardens by the Bay), its newly launched tasting flight menu is another reason to keep avid drinkers coming back. Titled Flights of Fancy, the repertoire showcases seven different sets of beverages ranging from Old and New World wines to sakes and beers. Your post-work drinks session just got a lot fancier. 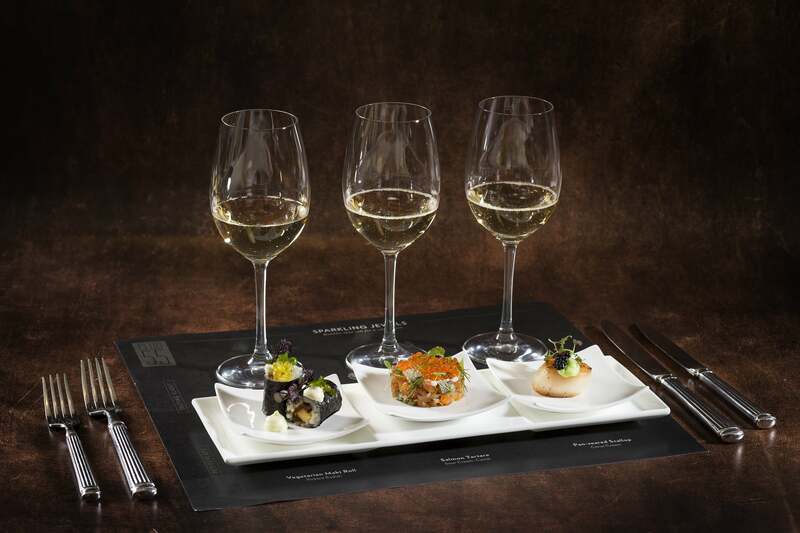 Each set features a trio of tipples to be savoured with Petit Plats — small plates the likes of pan-seared scallops, cheeses, braised beef cheek, and salmon tartare. Priced from S$44 to S$54, these offer variety without breaking the bank. 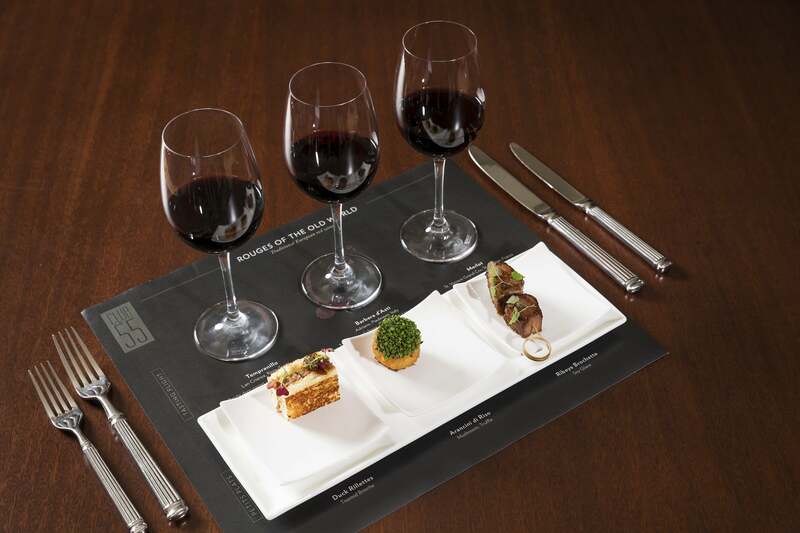 They’re also helpfully presented with a cheat sheet of tasting notes for your drinks. Ardent winos will adore the Rouges of the Old World, comprising an easy-to-drink Tempranillo Lan Crianzo from Rioja in Spain with hints of vanilla; a Barbera d’Alba Adriano (a Piedmont red with berry undertones); and a red fruit Merlot Clos Saint-Vincent Grand Cru — a plummy, full-bodied wine with blackcurrant notes, sourced from Saint-Émillion in France. These are deliciously paired with canapés of duck rillettes on toasted brioche, mushroom and truffle arancini, and juicy soy-glazed ribeye chunks. For those more inclined towards white wines, Les Blancs will hit the spot with its trinity of Torrontes Rutini Trumpeter (from Mendoza, Argentina), Sauvignon Blanc Errazuriz Estate (from Chile’s Aconcagua Valley, Chile), and Furmint Dry Disznoko from Tokaji in Hungary. This curated selection is meant to complement bite-sized portions of crab rillettes, goat cheese and chicken satay. The Rouges of the Old World set. If you’re craving sweeter libations, the Dessert for the Nobles is bound to satisfy with its 45ml pours of Goldloch Riesling Spatlese Diel (a delightfully sweet and fruity wine from Germany’s Nahe region), M. Chapoutier Muscat Beaumes de Venise (from Rhone in France, with fragrant floral notes), and Graham’s Fine Ruby Port (a rich and full-bodied tipple from Portugal). These are matched with crab rillettes ensconced in compressed watermelon, a fruit sablé tart, and blue cheese with grapes and fruit bread. Other highlights on the menu include a mocktail tasting flight of fruity concoctions, and a trio of vegetarian-friendly canapés such as hummus and vegetarian maki rolls. A flute of Piper Heidsieck Brut NV champagne can be added to any of the sets you order. Club55’s Flights of Fancy is available from 8pm from Mondays to Thursdays, and 8:30pm from Fridays to Sundays. More details here.